We were collected at the agreed time, however confusion reigned as the incorrect bus appeared to have collected us. We were eventually dropped off at their office and had to wait for the correct bus to collect us. The tour therefore started over an hour late. Due to the late start and late arrival at Cu Chi Tunnels, we were given the short hand version of the tour. There were people who had booked lunch which they had to forgo. Given that, the tour was interesting and should not be missed. Try the 50 meter tunnel walk if you are not claustrophobic.....!! Attend the most exciting history lesson ever on a Củ Chi Tunnels Tour! Learn about Vietnam's guerilla war by climbing into the underground tunnels that played a crucial part in the fight. Built by local fighters during the Indochina conflict, the Cu Chi tunnels served as base for Viet Cong, the National Liberation Front, where the local soldiers and residents used to eat, sleep, work, cook and even go to school. Started in 1948 as a hiding place from French air attacks, by 1965 the tunnel was estimated to consist of an astounding 200 km of tunnels. It included almost everything needed for the life of local inhabitants: hospitals, schools, meeting rooms, kitchens and more. 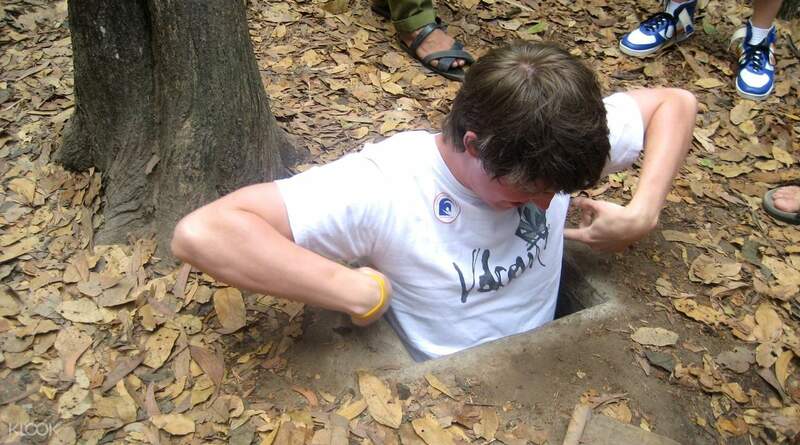 You will get to see and explore it all on the Cu Chi Tunnels half day tour. 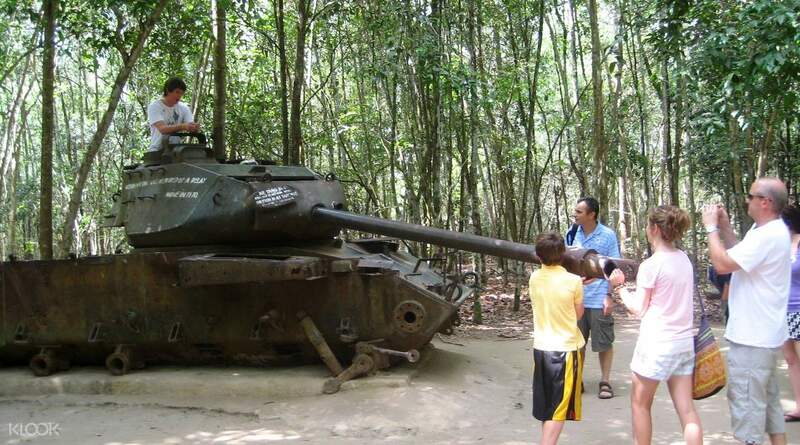 Understand Vietnam's guerrilla on the most interactive history lesson ever! It's a nice place to be covered up. Walking for almost 1 hour for looking around and downside the tunnel that amazing experienced. The toilet in cu chi tunnels is clean and has a muslim friendly. I really recommended this place to all muslim tourists. For the old people, you have to get your energy in a good health. Surely its a worth experienced to be here. It's a nice place to be covered up. Walking for almost 1 hour for looking around and downside the tunnel that amazing experienced. The toilet in cu chi tunnels is clean and has a muslim friendly. I really recommended this place to all muslim tourists. For the old people, you have to get your energy in a good health. Surely its a worth experienced to be here. It was really educational! We left at exactly 1 pm. Tour guide was fluent in English and knowledgable of what he’s saying. Me and my companions enjoyed the trip. 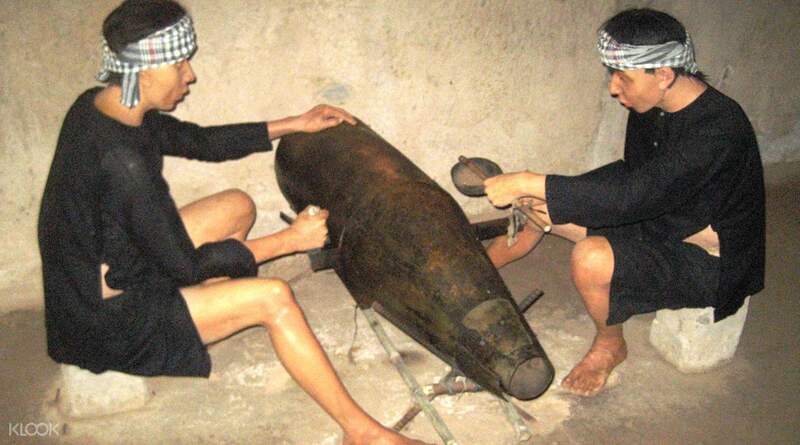 We saw the sacrifices of the Vietnamese soldiers just to survive war. Only downside of this was we were expecting that we were only a group of 15 as stated here. We were shocked that we were 30 or 40+. It was quite hard to concentrate with a large group and not much our liking. It was really educational! We left at exactly 1 pm. Tour guide was fluent in English and knowledgable of what he’s saying. Me and my companions enjoyed the trip. We saw the sacrifices of the Vietnamese soldiers just to survive war. Only downside of this was we were expecting that we were only a group of 15 as stated here. We were shocked that we were 30 or 40+. It was quite hard to concentrate with a large group and not much our liking. Tourist guide Yen was very informative (and funny). He took care of us and converse with us all day, which I appreciated. Hassle free experience. If it weren't so hot, I would have enjoyed Cu Chi tunnels more. Overall, I'd recommend this tour to foreign tourists. Tourist guide Yen was very informative (and funny). He took care of us and converse with us all day, which I appreciated. Hassle free experience. If it weren't so hot, I would have enjoyed Cu Chi tunnels more. Overall, I'd recommend this tour to foreign tourists. Our daytrip to Cu Chi Tunnels. I booked online through Klook, and once again experienced a seamless and enriching tour with my baby girls. We spent 2 hours by coach to get to Phu Hiep. The site was extremely large. We walked through dense vegetation, stopping sporadically at landmarks of significance. The weather was overwhelmingly hot and humid. One really felt empathy for anyone trying to survive in those conditions. My baby girl was first to try everything on offer. She lowered herself into darkened trap doors, walked underground in tunnels, and ventured into bunkers.... whilst her sookilala mother watched in amazement. 🌏💖 Afternoon tea was tapioca with nuts and sugar, with herbal tea. Beautiful. 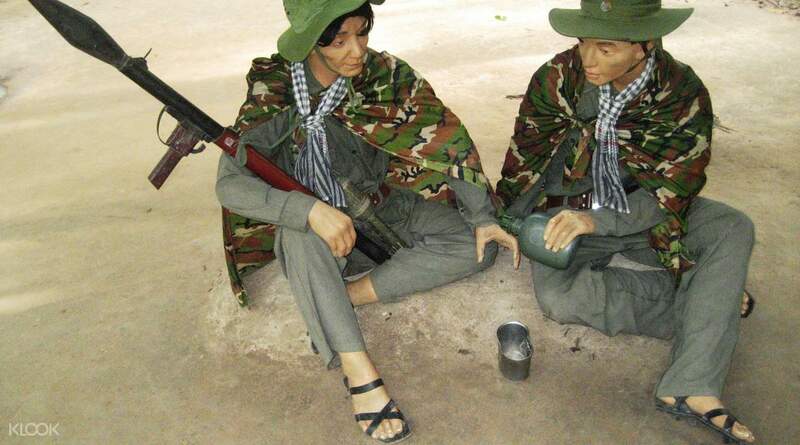 💖 Review: The Cu Chi Tunnels are part of a massive war museum in Ho Chi Minh. They offer visitors a sneak-peek at the underground life of Vietnamese soldiers commencing back in 1948 through to 1975. The site has over 120km of underground tunnels, with trapdoors, living areas, kitchens, storage facilities, armoury, hospitals, and command centres. After the war against the French, Vietnamese soldiers expanded the tunnels and included effective air filtration systems, which helped them survive the Cu Chi carpet-bombings in their resistence to American forces. A popular option is following the narrow routes of the underground tunnels. Some runnels are lit, others are dark. Most require bending and crawling in harrowing spaces. Our daytrip to Cu Chi Tunnels. I booked online through Klook, and once again experienced a seamless and enriching tour with my baby girls. We spent 2 hours by coach to get to Phu Hiep. The site was extremely large. We walked through dense vegetation, stopping sporadically at landmarks of significance. The weather was overwhelmingly hot and humid. One really felt empathy for anyone trying to survive in those conditions. My baby girl was first to try everything on offer. She lowered herself into darkened trap doors, walked underground in tunnels, and ventured into bunkers.... whilst her sookilala mother watched in amazement. 🌏💖 Afternoon tea was tapioca with nuts and sugar, with herbal tea. Beautiful. 💖 Review: The Cu Chi Tunnels are part of a massive war museum in Ho Chi Minh. They offer visitors a sneak-peek at the underground life of Vietnamese soldiers commencing back in 1948 through to 1975. The site has over 120km of underground tunnels, with trapdoors, living areas, kitchens, storage facilities, armoury, hospitals, and command centres. After the war against the French, Vietnamese soldiers expanded the tunnels and included effective air filtration systems, which helped them survive the Cu Chi carpet-bombings in their resistence to American forces. A popular option is following the narrow routes of the underground tunnels. Some runnels are lit, others are dark. Most require bending and crawling in harrowing spaces. I like the experience. The tour guide is very accommodating and friendly. I also like how he shared the history of the tunnel. My partner was so amazed and he really enjoyed going to the tunnel. Although I purchase something But the vendor did not put in my bag one of the products I purchased. I feel so sad because I really like the product supposed to be a gift to be given when we will go home. I like the experience. The tour guide is very accommodating and friendly. I also like how he shared the history of the tunnel. My partner was so amazed and he really enjoyed going to the tunnel. Although I purchase something But the vendor did not put in my bag one of the products I purchased. I feel so sad because I really like the product supposed to be a gift to be given when we will go home. Our bus left not on time but anyhow we arrived Cu Chi tunnels in perfect time. Anh, our tour guide is so dynamic and she explained everything well. She even inject some jokes which we gladly ride on to. The trail was long and every tunnel that we pass through has a unique story to tell. Some tried while some including me gladly waited for their coming out from a nearby hole. The tour ended with a taste of cassava dipped in peanut and salty thing. We arrived HCMC around 2:30pm and dropped off at Ben Thanh Street food market for our late lunch. Overall, the trip was awesome. Our bus left not on time but anyhow we arrived Cu Chi tunnels in perfect time. Anh, our tour guide is so dynamic and she explained everything well. She even inject some jokes which we gladly ride on to. The trail was long and every tunnel that we pass through has a unique story to tell. Some tried while some including me gladly waited for their coming out from a nearby hole. The tour ended with a taste of cassava dipped in peanut and salty thing. We arrived HCMC around 2:30pm and dropped off at Ben Thanh Street food market for our late lunch. Overall, the trip was awesome. The meeting place was so crowded so we had to stand up the whole time on the streets along with other tourist for different tours that day. The tour guide was the best. We took a stop over and showed how they made canvasses with egg shells. The price was pricey like 5x they were selling at Ben Than. The meeting place was so crowded so we had to stand up the whole time on the streets along with other tourist for different tours that day. The tour guide was the best. We took a stop over and showed how they made canvasses with egg shells. The price was pricey like 5x they were selling at Ben Than. It was an amazing half day trip. The guide Bill was funny, welcoming and speaks English very well! This tour is also good for families with kids or elder parents. I think it’s better to do this trip in the afternoon as it is hot in the morning. It’s been a great experience seeing the tunnels built during the Vietnamese war. Worth the price as well!! It was an amazing half day trip. The guide Bill was funny, welcoming and speaks English very well! This tour is also good for families with kids or elder parents. I think it’s better to do this trip in the afternoon as it is hot in the morning. It’s been a great experience seeing the tunnels built during the Vietnamese war. Worth the price as well! !